BBC NEWS | UK | UK Politics | Can Prescott move on from affair? Can Prescott move on from affair? 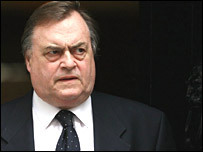 Like so many politicians, John Prescott doesn't really do "sorry". So it should probably come as no surprise that, in his first interview since the revelations of his affair and his apparent demotion, the word did not pass his lips. Indeed, he dealt with the affair with his secretary, which has been splashed across the newspapers for two weeks, in very short order. Speaking to his biographer, the Independent journalist Colin Brown, he said: "You could say that it's certainly been a period of reflection to analyse how I've acted. Anybody who doesn't feel affected by something as traumatic as that has lost their sensitivity. "I have learnt my lesson about these matters. "I have been stupid. I don't think there is any doubt about that. I have felt it over the week or so but I have to get on with the job and do what I can." But then, asked if he believed his secretary, Tracy Temple, was a "gold digger" he added: "I have no comment on that. I was the one who acted stupidly. That's life." He again expressed his dislike of the media - an emotion that has undoubtedly intensified after the revelations over his affair - and something that comes as no surprise at all to any journalist who has ever had dealings with him. His famous two fingered salutes to the press pack are evidence of that. But that is all he was prepared to give on the crisis that battered the government and ended when he lost his departmental responsibilities in the Cabinet reshuffle last week. Whether his "that's life" approach will help rebuild his standing amongst those Labour MPs and party members who have been critical of and even dismayed by his behaviour remains to be seen. For the rest, this interview was the same old Prescott, defending his abilities, accusing his detractors - notably former Tory deputy prime minister Michael Heseltine - of snobbery and hinting once again that he will be central to the handover of power between Tony Blair and Gordon Brown. He even went so far as to suggest this autumn's party conference would be the point where the transfer of power would become explicit. Between now and then, he will act as the prime minister's "deal maker" across Whitehall, and do what he can to help that orderly transfer of power. He started that process by warning Labour MPs not to "get into a war" over the leadership succession now because it would only damage the party. There was no suggestion he believed his own behaviour had damaged the government. He insisted Tony Blair did not demote him in the reshuffle, but had simply agreed to his own, year-old request to ease his workload. But he told the prime minister, because of the "damned circumstances", people would just think it was "a knockdown" which it was not. He retained huge responsibility for chairing cabinet committees, for example, he declared. That, he suggested, is why he was allowed to keep all the perks of office - cars, a mansion, a government flat and so on - even though he doesn't have an office. That has been the source of fierce criticism from opposition MPs. But even some of his own backbenchers say that given he no longer has a government department, he should no longer be receiving taxpayer-funded perks. Mr Prescott acknowledged he was "getting the perks", but added "I am getting no more than others got". An earlier deputy prime minister, Lord Heseltine, who has led the criticisms, was accused of "snobbishness". 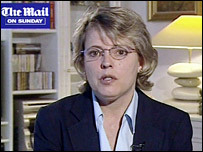 "Heseltine already has a big house in the country, and perhaps others in other parts of the world. I have one house, and one car," he insisted. So, in the end, this was probably Mr Prescott's attempt to justify his current position and put the crisis over his affair behind him and start rebuilding his standing within the Labour Party. 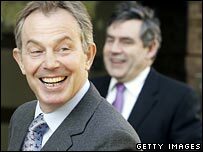 Few doubt that, at this particular point, Tony Blair and Gordon Brown need a Prescott figure more than ever before. Whether Mr Prescott can now continue to fill that role with the authority and respect he once commanded - particularly in the face of growing demands for him to be stripped of his ministerial perks - remains to be seen.